Rules of Origin (RoO) are the requirements which set out the working and processing that must be undertaken locally in order for a product to be considered the “economic origin” of the exporting country. This distinction becomes necessary and important where some of the materials used in the production or manufacture of a good are imported from other countries. The purpose of RoO is to prevent trade deflection and transhipment, whereby goods made elsewhere are merely routed through a beneficiary country (of trade preferences) with no or insufficient local value-adding activities having taken place. Without RoO, trade preferences would be exploited and severely undermined by non-beneficiary countries. The stringency of the relevant RoO impacts on the ability of producers and exporters to meet their requirements and can have a significant impact on trade. While apparel and textiles articles are not included under the General System of Preferences (GSP) program, on which AGOA is based, AGOA nevertheless provides qualifying countries with duty-free market access for these items, provided adherence with the RoO and general administrative requirements including the textiles certificate of origin. Countries from AGOA-eligible Sub-Saharan African countries wanting to export apparel duty-free into the United States under AGOA must first be certified as having complied for the 'Wearing Apparel' provisions” (follow link to Country Eligibility in the About AGOA menu). This entails having taken adequate steps to "establish effective product visa systems to prevent illegal transshipment and the use of counterfeit documentation, as well as having instituted required enforcement and verification procedures". Apparel made in qualifying Sub-Saharan African countries from domestically produced fabric and yarns, or from fabrics and yarns produced in AGOA-beneficiary countries in Sub-Saharan Africa, qualifies for preferences. Such market access into the U.S. is subject to a quantitative restriction (currently 3.5% of overall garment imports by the United States from all sources). To date, this cap has not been an effective quote as aggregate AGOA apparel exports were significantly below the threshold. The cap is measured in Square Meter Equivalents (SMEs), and has no dollar equivalent. Rather, it is based on the aggregate SMEs of all apparel articles imported into the US in the preceeding 12-month period for which data is available. Apparel otherwise eligible for preferential treatment under AGOA shall not be ineligible for the duty-free benefits simply because the article contains certain interlinings of foreign origin, as long as the value of such interlinings (and any findings and trimmings) does not exceed 25 percent of the cost of the components of the assembled apparel article. "De Minimis Rule" (see the AGOA Legislation, page 13): Apparel otherwise eligible for preferential treatment under AGOA shall not be ineligible for such treatment simply because the article contains fibers or yarns not wholly formed in the U.S. or in one or more AGOA-beneficiary SSA countries if the total weight of all such fibers and yarns is not more than 10 percent of the total weight of the article. A special rule for 'Lesser Developed Countries' (LDCs, classified as such by their GNP per capita being less than $ 1,500 in 1998 as measured by the World Bank), which initially allowed such countries duty-free access for apparel made from non-originating fabric for a 4-year period until September 30, 2004 (see pages 9-10 in AGOA Act under Downloads). AGOA III extended this provision by a further three years to September 2007, and AGOA IV to 2012. This was extended in September 2012 to the end of 2015. Some countries, like South Africa, Gabon and the Seychelles are not designated as LDCs and therefore do not benefit from this waiver from normal rules of origin. Manufacturers of apparel wishing to export duty-free to the U.S. under AGOA are required to "maintain complete records of the production and the export of covered articles,including materials used in the production, for at least 2 years after the production or export" (see AGOA Legislation, page 14 in Downloads/Legal section). For this purpose, manufacturers are required to draw up and sign a "Certificate of Origin", a sample of which can be accessed in the Downloads/General section. Countries that are eligibe under the ‘Wearing apparel’ provisions (so-called Category 9 products) are listed in the Country Eligibility section. Preferential treatment for handloomed fabric and handmade articles made from such handloomed fabric is avalaible to a number of AGOA-eligible countries. These are likewise listed in the table in the Country Eligibility section. "Wholly formed" – when used with reference to yarns or thread, means that all of the production processes, starting with the extrusion of filament or the spinning of all fibers into yarn or both and ending with a yarn or plied yarn, took place in a single country, and when used with reference to fabrics, means that all of the production processes, starting with polymers, fibers, filaments, textile strips, yarns, twine, cordage, rope, or strips of fabric and ending with a fabric by a weaving, knitting, needling, tufting, felting, entangling or other process, took place in a single country. "Knit to shape" – applies to any apparel article of which 50 percent or more of the exterior surface area is formed by major parts that have been knitted or crocheted directly to the shape used in the apparel article, with no consideration being given to patch pockets, appliques, or the like. Minor cutting, trimming, or sewing of those major parts will not effect the determination of whether an apparel article is “knit-to-shape”. The use of non AGOA-originating collars, cuffs, drawstrings, padding / shoulder pads, waistbands, belts attached to garments, straps with elastic and elbow patches is permitted without compromising the AGOA-status of the garment. 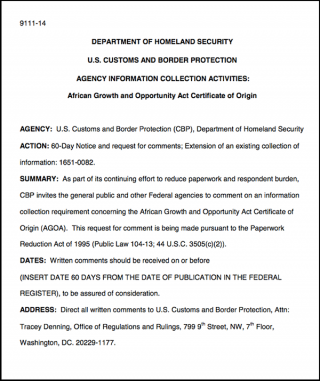 This is an amendment under the so-called "AGOA III" amendments. "Findings And Trimmings General Rule": An article otherwise eligible for preferential treatment shall not be ineligible for such treatment because the article contains findings or trimmings of foreign origin, if the value of such findings and trimmings does not exceed 25 percent of the cost of the components of the assembled article. Examples of findings and trimmings are sewing thread (except if the thread is under 9819.11.06), hooks and eyes, snaps, buttons, `bow buds', decorative lace trim, elastic strips, and zippers, including zipper tapes, and labels. Elastic strips are considered findings or trimmings only if they are each less than 1 inch in width and used in the production of brassieres. "Certain Interlinings General Rule": An article otherwise eligible for preferential treatment shall not be ineligible for such treatment because the article contains certain interlinings of foreign origin, if the value of such interlinings (and any findings and trimmings) does not exceed 25 percent of the cost of the components of the assembled article. Interlinings eligible for the treatment described above include only a chest type plate, a `hymo' piece, or `sleeve header', of woven or weft-inserted warp knit construction and of coarse animal hair or man-made filaments. "De Minimis Rule": An article otherwise eligible for preferential treatment shall not be ineligible for such treatment because the article contains fibers or yarns not wholly formed in the United States or one or more beneficiary Sub-Saharan African countries if the total weight of all such fibers and yarns is not more than 10 percent (increased under AGOA III from 7 percent) of the total weight of the article. Textile or textile articles originating entirely in one or more lesser developed beneficiary country (Cat 0). This covers fibres, yarn, fabric, made up goods such as towels, blankets, sheets, floor coverings etc. Certain components – use of non AGOA produced collars, cuffs, drawstrings, padding, shoulder pads, waist bands, belts attached to garments, straps with elastic, elbow patches, allowed. 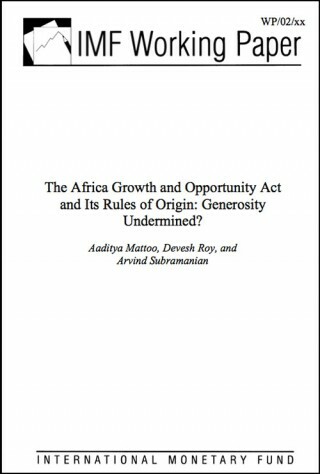 IMF Report - AGOA and its Rules of Origin: Generosity undermined? 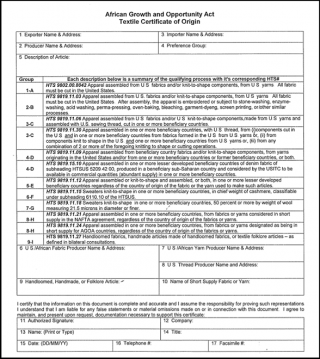 Textile certificate of origin (May 2008 version).